In this post I maintain up-to-date DreamHost server location & data center specs, and also a speed test with other useful information. Generally server locations are undisclosed so this is based on my own research. DreamHost is an experienced web hosting provider founded in 1997; dedicated to remaining a privately held company with it’s own redundant Linux powered data center. They are connected to multiple service providers for optimized connectivity and guarantee a 100% uptime for all their customers. It’s run by DreamHost’s New Dream Network, LLC; headquartered in Los Angeles — which is also the heart of the hosting company’s management operations. I’ve conducted a speed test of the Weatherhead East Asian Institute’s DreamHost hosted website at Columbia University by using Pingdom Tools. 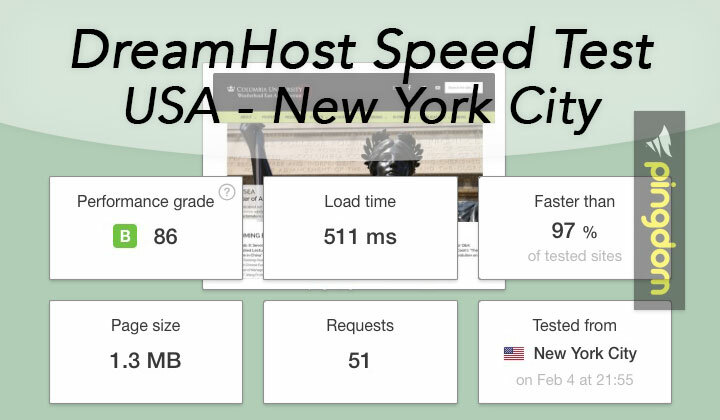 Their website uses the WordPress CMS; and despite a page size of more than 1MB and excessive amount of requests, a brief test result shows that they are managing to reach page loads of up-to just 511 ms from New York — also other US based testing locations were giving out similar speeds results. This would suggest to rank DreamHost as a high-end hosting provider, despite the lack of released specifications about their server infrastructure and hardware. Page load speeds of half a second or less measure a time that it roughly takes to blink ones eyes. However to reach such potential outside the US one would need to utilize CDN services (read more about that below). This is one of the most classic and well known web hosting companies that stand out from the crowd with personalized service. Contrary to a large part of existing big hosting services in the USA and other countries, they have not sold their souls to the corporate takeover by Endurance International Group (known as EIG). With operations since 1997, they have managed to gather a big customer base — now attempting to reach half a million customers. They reconfigured their servers from the Debian architecture to Ubuntu OS in 2013. The company itself is located in Los Angeles and amount of staff is at around more than 100 personnel. They offer a wide variety of hosting, cloud and domain registration services. Despite one single data center location, they boast as a global hosting company through their strategic US location — and DreamSpeed CDN services which brings fast worldwide connectivity to DreamHost customers on the Fastly network. The global CDN network covers extensive locations in North America, South America, Europe, Asia and Australasia — Ashburn, San Jose, Los Angeles, Seattle, Boston, New York, Dallas, Minneapolis MN, Atlanta, Denver, Miami, Chicago, Columbus (USA); Montreal, Toronto (Canada); São Paulo (Brazil); Osaka (Japan); Hong Kong (HK); Dubai (United Arab Emirates); Tokyo (Japan); Madrid (Spain); Amsterdam (Holland); Singapore (SP); London (UK); Paris (France); Stockholm (Sweden); Frankfurt (Germany); Auckland, Wellington (New Zealand); Brisbane, Melbourne, Perth, Sydney (Australia); Chennai, Mumbai (India); South Africa; Tel Aviv (Israel). Please, leave your questions/experience with DreamHost in comments below! 1. Cloud hosting where servers are located in the US with US registered IP addresses. 2. Resource scalable: How possible and how easy would it be to increase storage space, RAM, etc if we needed it? 3. The ability to host websites using WordPress and Joomla content management systems. 4. All hosting accounts managed using Web Host Manager (WHM). Can you please help me understand data security and back up and data retention period, OS and Software stack upgrades. Your post isn’t very well researched. They’ve had a datacenter in Virginia for like 5 years now. This mistake has been since corrected. Thank you! Interesting, I wonder why they don’t make it more public where their servers are located.